A mother has posted on Facebook a video of her 14-year-old daughter being attacked by a group of about 20 girls. 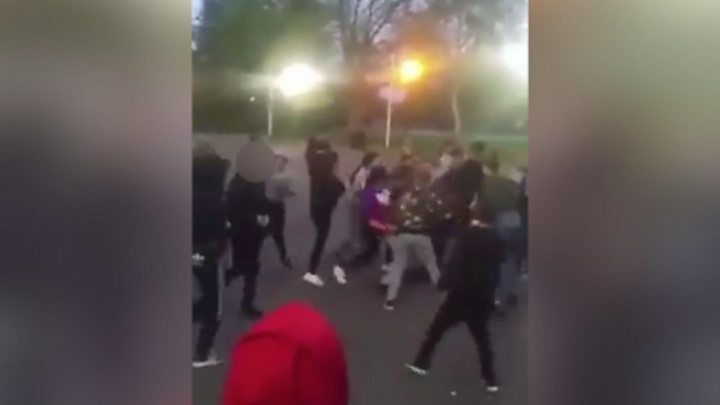 The Lithuanian schoolgirl was left bruised in the brawl in Central Park in Peterborough on Friday evening. The Peterborough Telegraph reported her mother put the film on her own Facebook page in a bid to find out who was responsible. It has been viewed more than 680,000 times. Police said the fight was reported to them and they were investigating. The attack victim told the BBC the group wanted to fight her because they thought she was "being cheeky" to some of them at school. She was set upon by a "group of about 20 or 25 girls" when she went to the park. She said: "They said, 'We didn't come here for no reason, we came to fight'." "I was scared... but I think I'm getting better," she added. The video of the brawl showed a girl being pushed to the ground and repeatedly kicked. It was sent to her mother, Ilona Iloniuk, who posted it on social media. The post said: "Today my daughter in Central Park got beaten up by a lot of girls. Maybe somebody knows who they are? "I think that parents should look after their kids - she was only one and they were 20 on her." Cambridgeshire Police said the brawl happened between 20:00 and 21:00 BST.